No one has come forward to point out my glaring oversight, but somehow September 23rd, 2016 – National Great American Pot Pie Day – came and went without notice, flying completely under my radar. My apologies: I intended no slight. But shame on me anyway for not tipping my hat to a category of pies that I adore, and one with such a colorful past. Colorful, though perhaps not a past that will whet your pot pie appetite. 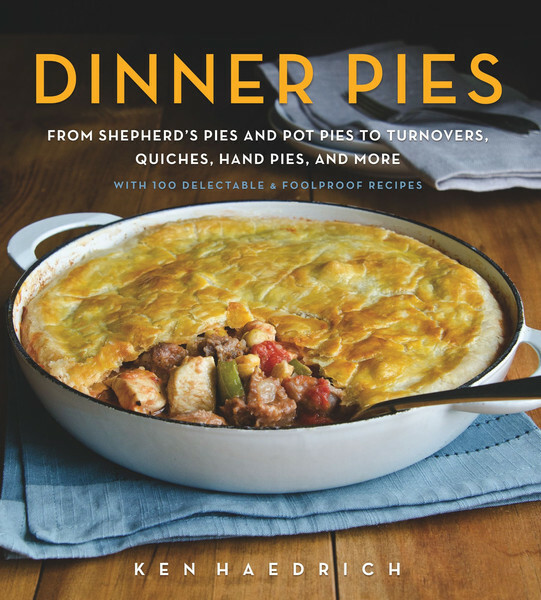 Back in medieval times, the pot pie was a catchall for chickens, rabbits, blackbirds, large game, just about anything the cook cared to toss in. The crust was a thick, tough affair – words that some of you have used to describe your own pastry – in the shape of a vessel known as a coffin, a truly unfortunate term for anything related to food preparation. The pie filling was baked within, and the crust discarded or left for the help to chisel away at and consume. Incidentally, those four and twenty blackbirds? 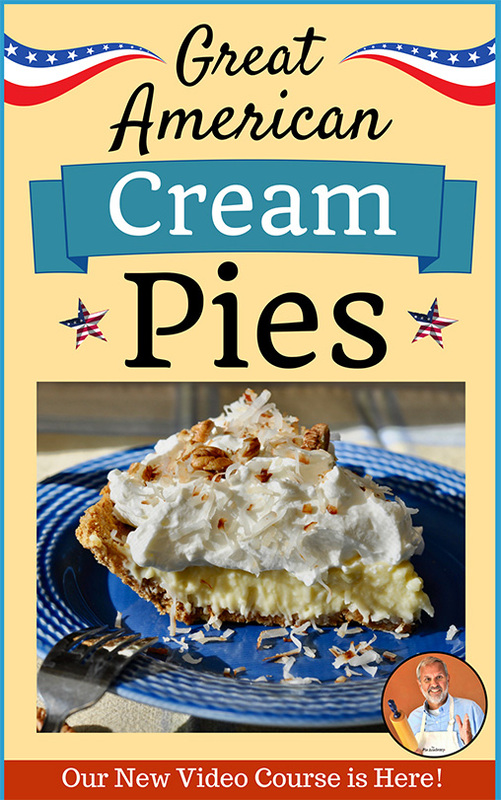 They weren’t actually baked in a pie as the nursery rhyme would suggest, at least not always. 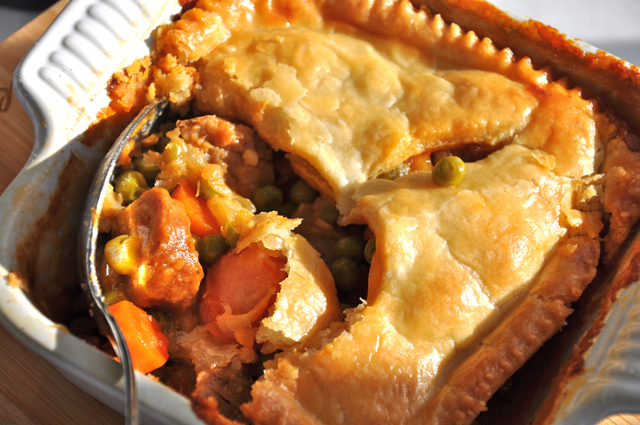 Clever chefs would construct jumbo pot pies with removable lids or trap doors. The birds would be staged in the pie just prior to mealtime and then fly out for the big reveal. Dinner guests loved it. Apparently this passed for fun in those days. Eventually the pot pie would come to America, go to finishing school and evolve into the relatively tame dish we know today – saucy, delicate of crust, and typically made with chicken or beef. Flightless, but predictably good. But pot pie doesn’t have to be too predictable. 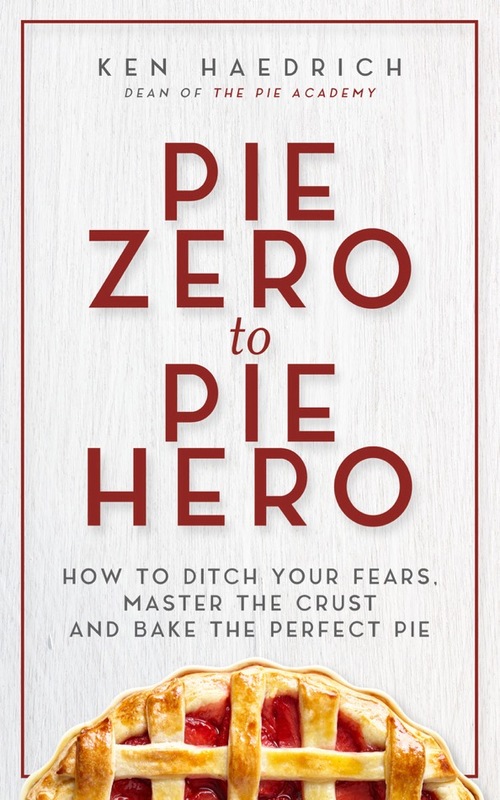 In fact there are any number of ways to elevate the pot pie – some of which I covered in my book Dinner Pies – and surprise your dinner guests with what lies beneath the crust. 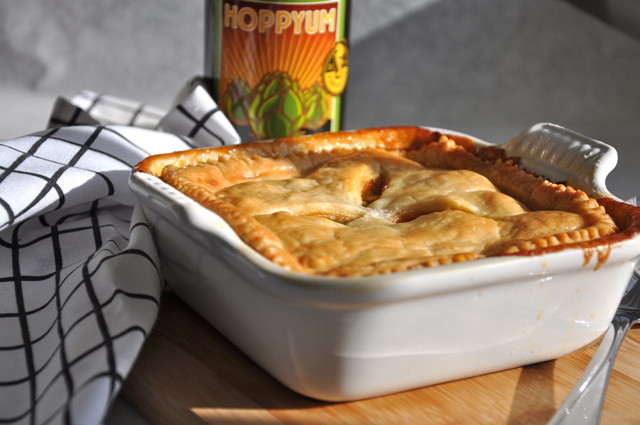 Here’s one such suggestion: Brats and Beer Pot Pie, a real champ of a warming, cold weather dish. Cooking bratwurst in beer (ale or stout; I’ve used all of them) isn’t exactly groundbreaking. 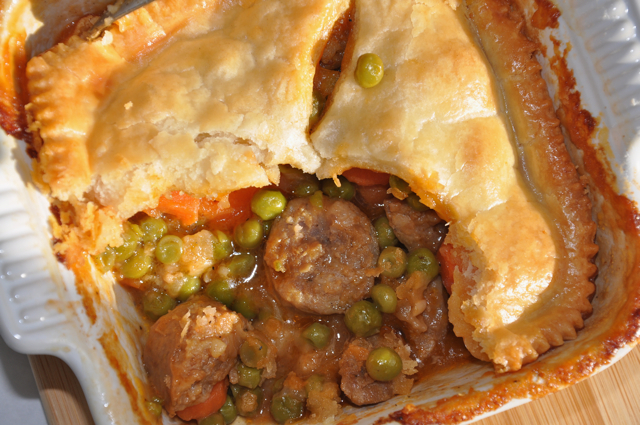 But turning them into a rich, deeply flavored stew with carrots, peas, and seasonings, and then adding a top crust, is a bit more novel, not your everyday approach to pot pie. And man, it’s delicious! You’ll really be missing out if you don’t try it. As for the beer, simmering the stew cooks off the alcohol, so all that remains is the subtle, lingering flavor of the brew. I’ve tried to streamline things for you by using just a top crust and no bottom crust. I prefer both, but it’s faster and easier to do just the lids. In addition, a single batch of dough will make enough pastry for six individual pies, rather than half that many. Besides, the dish is pretty rich to begin with so you’ll be spared some calories with top crusts only. Enjoy. Now, would someone please remind me when National Great American Pot Pie Day rolls around again. Wouldn’t want to miss it two years in a row. 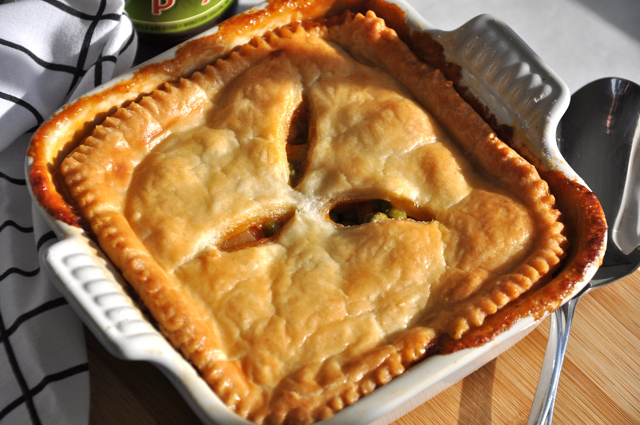 PASTRY NOTE: Use any favorite single crust pie dough recipe to make the lids for these pot pies. You will find a number of possibilities by clicking on the Table of Contents tab at the top of the page. Prepare the dough as directed, dividing it into 5 or 6 pieces, depending on the size of the individual pot pie dishes you'll be using (they should each have a capacity of 1 - 1 1/4 cups.) Shape the pieces into thick disks, then wrap them in plastic and refrigerate for about 1 hour. While the dough chills, butter or oil 5 or 6 pot pie dishes and set them aside. Heat the oil in a large stovetop casserole. Prick each of the sausages several times with a fork and add to the pan. Brown on all surfaces, a total of about 6 or 7 minutes. Transfer the brats to a plate and set them aside. Divide the filling evenly among the buttered dishes. 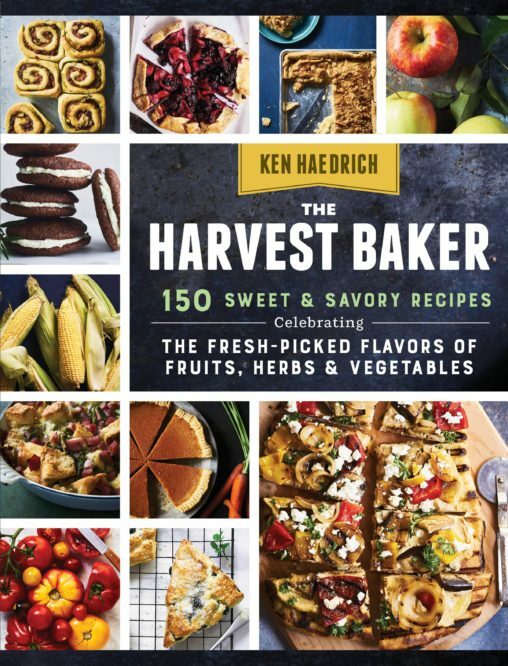 Cool for 15 minutes while you preheat the oven to 375°. Working with one piece of dough at a time (and leaving the others in the fridge), roll the pastry a tad larger than the diameter of the pie dish. Drape the pastry over the filling and press gently so it settles on the filling. Poke the center of the pastry with the tip of a paring knife to make a steam vent. Repeat for the other pies. Place the pies on a large baking sheet, preferably one lined with parchment. Brush the tops lightly with the egg wash. Bake on the center oven rack for about 40 minutes, until the pastry is golden brown and the filling bubbles. Transfer to a rack and cool for at least 10 minutes before serving. MAKES 5 to 6 SERVINGS.